Taking a broad approach, Beyond Quality in Early Childhood Education and Care relates issues of early childhood to the sociology of childhood, philosophy, ethics, political science and other fields and to an analysis of the world we live in today. It places these issues in a global context and draws on work from Canada, Sweden and Italy, including the world famous nurseries in Reggio Emilia. Working with postmodern ideas, this book questions the search to define and measure quality in the early childhood field and its tendency to reduce philosophical issues of value to purely technical and managerial issues of expert knowledge and measurement. 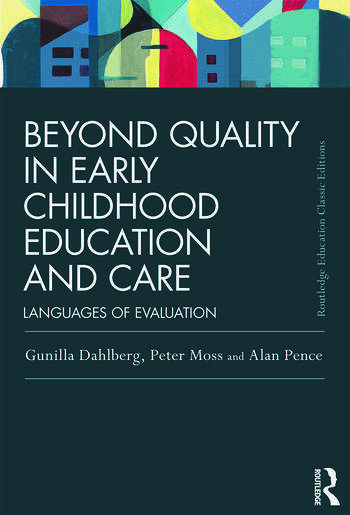 With a brand new Preface to this classic text, the authors argue that there are other ways than the 'discourse of quality' for understanding and evaluating early childhood pedagogical work and relate these to alternative ways of understanding early childhood itself and the purposes of early childhood institutions. Gunilla Dahlberg is Professor at the Institute of Education, Stockholm, Sweden. Peter Moss is Emeritus Professor of Early Childhood Provision at the Institute of Education, University of London, UK. Alan Pence is Professor at the School of Child and Youth Care, University of Victoria, Canada. 'The authors of this book offer a wonderful provocation for early childhood professionals. Reading it, I found myself encountering new and irresistible ideas—ones that led me to my own playful tangents. The places the authors describe that are ‘beyond quality’ open exciting and challenging possibilities for the field of ECE.' (Elizabeth Jones, Faculty Emerita, Human Development, Pacific Oaks College, California). 'Beyond Quality in Early Childhood Education and Care is a book for reflection, dialogue, and exchange on the ideological, contextual, cultural and existential diversity of childhoods across the globe. It questions modernist Minority (Western) World perspectives and the approach to early childhood education and care to which they give rise.' (Bame Nsamenang, Head, University Cooperation Division, University of Bamenda, Cameroon; and Director, Human Development Resource Centre).